As I get older, I find myself revisiting my younger years more and more often. Did I lead the life I intended? have my ideas, my beliefs, my opinions changed? How has my outlook on life evolved over the years? Do I get stubborn as I get older? Is life still worthwhile? In A Man called Ove, Backman describes an excellent case in point: Ove, an - ahem - older man, who cannot deal with his wife's passing. He can no longer fit in with society's new sets of rules, he can no longer understand how people function... Enter a drastic solution: he will kill himself. This is a tragic decision and should not be treated lightly. And yet, when he fails - miserably - more than once to go through with it, it is with a little smile that I react. The combination of comedy and tragedy, as well as the true facts about modern life (indeed, they don't make ropes as sturdy as in the past), ensure that this book is not a gloomy account of a lonely life, but rather an account of how such a "misfit" can actually fit in with the rest of society. The link: Parvaneh, an Iranian neighbour - with all the clichés that apply to a "southern" woman: loud, persistent, family-oriented, making food for everyone (I personally know such an Iranian woman, and I can see where the inspiration comes from...). Parvaneh enters Ove's life like a compactor and there's no escape. (I believe she's realised what Ove was trying to do from the very beginning, which makes her get involved even a bit more). She feeds him, she makes him take on a stray cat, she gets him to drive her to the hospital, where he's also left to care for her daughters... There is no end to all the intrusion and Ove cannot escape! Slowly, we see a transformation in Ove: from a truly grumpy old man, he slowly agrees to "teach" the new generation how things are done (he's still of a generation of Jack of all trades - something that even I see is missing from the younger generation, and I'm supposed to be only middle-aged). But not only that: as many real-life examples show, the older generation can still contribute and enhance the lives of the young ones. There is enough distance to look at things in a calmer manner (the relationship of parents-children will almost always be problematic, whereas that of grandparents and children is potentially beneficial for both). And so Ove becomes a surrogate grandfather to Parvaneh's daughters, while he proves he's modern enough to accept and put up a homosexual guy when he's thrown out of his parents' house. He becomes an active member of his little community. And the community loves him back. 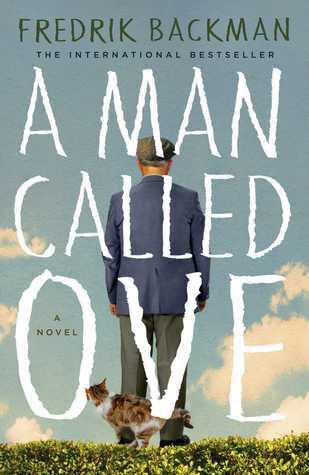 For the visual interpretation of this book, I also watched the film "A man called Ove". A very good adaptation, it perfectly complemented the reading! I really loved this book and have enjoyed his two following books too.